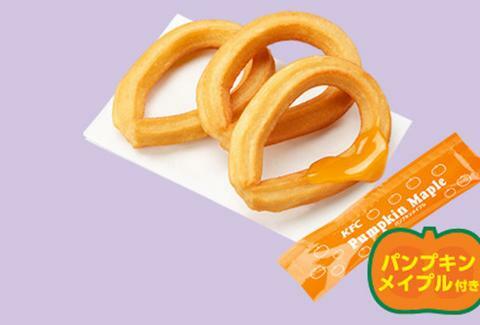 It's no secret that Japanese fast food has been on a serious pumpkin spice kick lately, and this week, Japanese KFC franchises have officially thrown their hat in the churro ring. The fried chicken empire is rolling out ring-shaped churro bites, complete with a pumpkin-maple sauce, as a part of a fall promotional push.The sweet snack is a key component of the chain’s brand spankin’ new “Halloween Barrel,” a spooky-looking bucket filled with your standard fried chicken assortment (four pieces of Original Recipe plus chicken tenders for the wusses), French fries, and two orders of Ring Churros. Unlike Taco Bell’s light, airy Cinnamon Twists, this deep-fried pastry falls on the thicker, chewier end of the spectrum. The syrupy sauce can be bought separately, and rumor has it that it makes a pretty fantastic chicken dipper, too. 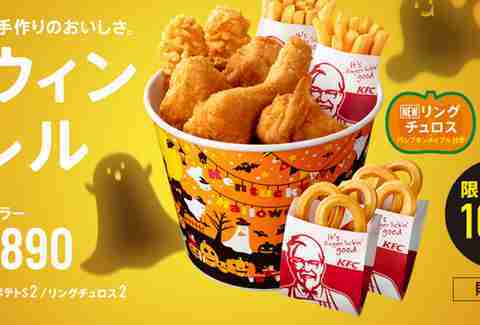 The special bucket and its seasonal treats sell for 1890 Yen (about $18 USD) and are only available through Halloween, a holiday that the Japanese adults have apparently lost their damn minds over in recent years. Kinda makes your cider donuts and Amazon.com costume all seem a little quaint. Meredith Heil is a staff writer for Thrillist. Before anybody wanted Thrill-est beats, she and her girl split the buffet at KFC. Follow her at @mereditto.